For the entire week, there will be a stand in Italská Building (IB), with a big box where it will be possible to donate the clothes at all times. You just bring your clothes in a bag, drop it into the box and that’s it! As easy as that! WHAT KIND OF CLOTHES ARE WE LOOKING FOR? 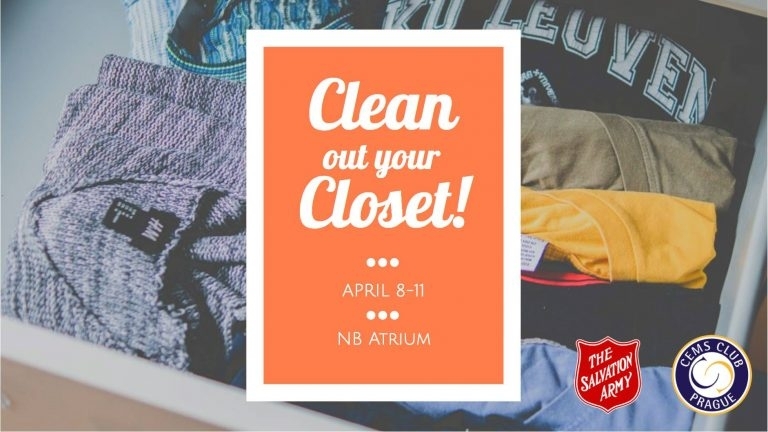 Any clothes you decide to donate will be appreciated! The only two conditions are that the clothes are clean and still usable! The Salvation Army will then make sure that the clothes go to a place where it’s needed the most. – Men clothing, especially winter clothes & shoes are lacking. – Clothing for women, even underwear is very useful. – Cosmetics (even open bottles could be reused) and especially unused pads or tampons. – Also toys for kids, books or any kitchen utensils. The donated goods will be distributed directly to locations of Salvation Army in the entire Czech Republic, these are asylum houses, dormitories, hygienic centers and many more. The objective of the Salvation Army in Czechia is physical, social, moral and spiritual support to people of all ages based on the Christian principles. The whole event is organized by students from CEMS Club Prague and The Salvation Army.